The Pole Game 2007 Edition for PC and XBox360 is now online! 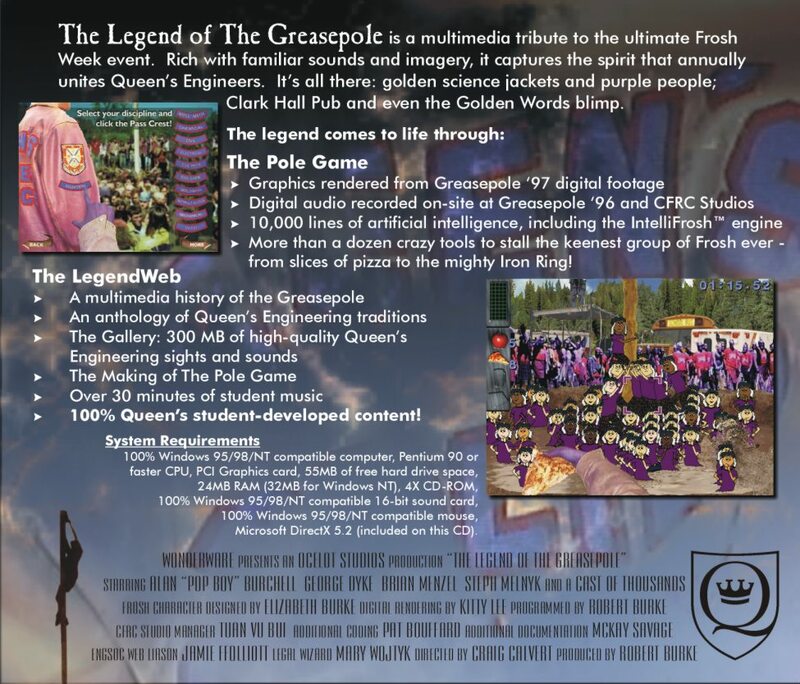 The Legend of the Greasepole is a multimedia tribute to the ultimate Frosh Week event. Rich with familiar sounds and imagery, it captures the spirit that annually unites Queen's Engineers. It's all there: golden science jackets and purple people; Clark Hall Pub and even the Golden Words blimp. We've posted a compete copy of The Pole Game here on the EngSoc web server. Copies of the Legend of the Greasepole CD are scarce, and we wanted to make sure everyone gets a chance to relive the unexplainable. In The Pole Game, just like at the real pit, the Frosh only succeed when they learn to work as a team, taking advice from upper year students like the game's Al "Pop Boy" Burchell. And just like real life, the game tells the story of the Frosh's inevitable victory over the Pole. You can knock them down, but you know they'll get back up again. And even when you're teasing them, you know you really love 'em. The Greasepole event is about spirit, and team building, and working together toward a common goal. It has brought Queen's Applied Science students together for decades, just as it will next year. Long may the tradition live on. The LegendWeb is also online! In July 2004, we posted the LegendWeb here on the EngSoc web server. Some highlights include McKay Savage's photographic history of the Greasepole, a sampling of stuff we amassed while making The Pole Game, and Craig Calvert's sonic and visual Gallery.